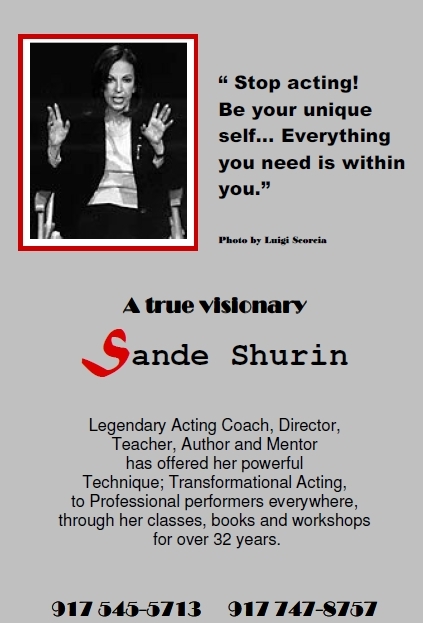 BreakThrough can say without reservation, “Sign up NOW!” Sande Shurin’s workshops fill up fast so call the main office 845 684-5537 or email studio@sandeshurin.com to secure your spot! July 12th New York Intensive is beginning at 2:30 instead of 1:30 ending between 7:30 and 8:30. Bring a 1 page scene that brings out the best in you. Use material from beginning, middle (crisis or pitched) and end of same material. Always best to use a film script. Bring a copy for the reader. Also be prepared to do an improv exercise at a picnic/party. pack whatever you need to go to a picnic as your character…possible activities: food, drinks, music, instruments, learning a skill, exercise, dancing, learning a song or other language, knitting, drawing….and on. Dress as you would to go to an audition. Same Time for Sunday August 16th. Just the script is required. I will let you know if you need to do anything else by beginning of Aug. If you are new to this technique you will need an appointment for a Skype or Face time phone private session with me before the Intensive. If you have some experience in our technique you will not need a private session. No class this Thursday. And the week after is July 4th weekend so we will resume classes the following Thursday which will be Thursday July 9th. July 16th and 23rd we will be working on monologues. So you may want to start looking for suitable monologues that you could be cast for. These two classes are opened to the public. So if you know actors interested in getting their monologues together this would be great classes to invite them to. If if actors have worked with us before this would be a great 2 day ( 2 consecutive Thursday) refresher. 4 Consecutive Thursdays September 10th, 17th 24th and October 1st beginning at 6:30 ending around 8:30 or 9:00. New or former students welcome to this 4 day workshop. The cost is $160.00.